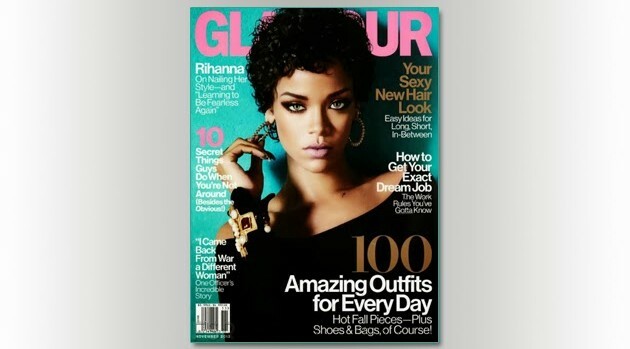 Facebook.com/GlamourIf all you knew of Rihanna was what you saw on her Instagram or Twitter feed, you’d assume she’s a jet-setting, foul-mouthed party animal who smokes a lot of weed and enjoys getting naked. But Rihanna says that anyone who thinks they know the “real” her has got it all wrong. While Rihanna acknowledges that she can’t “run from” the attention, she insists that, despite the fact that the haters are “gonna keep knocking away until all this comes crashing down, I’m not gonna ever crash. I’m in control.” However, she admits that there was a time that she lost her self-confidence. She doesn’t say what caused that to happen, but it’s probably not a stretch to think it might have something to do with what happened between her and Chris Brown. “I had to regain my fearlessness because it did go away for a little bit,” she admits to Glamour, adding, “My mother said something to me a few years ago: ‘I’ve seen something in your eyes I’ve never seen before: fear.’ She was like, ‘No, this is not you. '” So what happened to change that? “I just got back to being OK with myself,” says Rihanna. Pick up the new issue of Glamour, out now, to read the full interview.